Two books—they couldn’t be more alike in one respect, yet completely different in others. One is a serious historical tome, important in its documentation of a racing period we will never see again. The other is a great beach book. And, of course, they both have the same activity in similar weather in their titles. 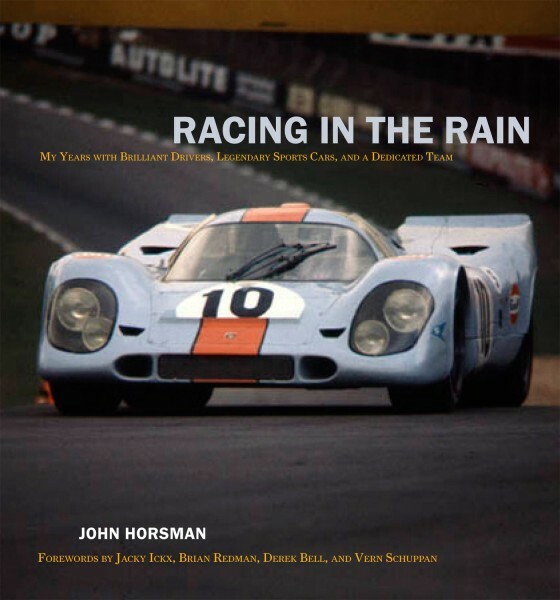 Racing in the Rain is John Horsman’s autobiography, his personal, definitive account mainly of his racing career spanning more than two decades. I particularly enjoyed learning of his early activities as a John Wyer apprentice at Aston Martin. This was during the development of the Tadek Marek 3.7-liter engine in the early DB4 days, the first car completely designed by the company under David Brown. From this start at Aston Martin, Horsman eventually rejoined Wyer, becoming project director of the GT40 program at Ford Advanced Vehicles. Then there is his tenure with the blue-and-orange Gulf-sponsored Ford GT40s, Mirages, and Porsche 917s. All were prepared by Horsman and his team: You may remember…they ran well in the rain. It is a solid book containing historical information, technical analysis of racing achievements and failures while also giving the reader insights into the personalities of many in the racing community. Horsman turns lesser-known names into real people and adds substance to the people with names already familiar to us. He has an enviable way of conveying sometimes detailed historical racing data without drawing the reader away from his story line. More on those personalities and insights; I have been a fan of Speed’s Formula 1 coverage for years. One of Speed’s highly regarded commentators is David Hobbs. I find his observations uncannily perceptive, invariably accurate, even entertaining. He lets his humorous British sarcasm prevail whenever circumstances warrant. I’ve not seen or read anywhere else such a first-hand and factual coverage of David’s earlier racing exploits than what is presented by John Horsman in this book. But Racing in the Rain is not just about one driver, one course, one marque, or one period. There’s so much here that you’ll likely not merely devour it in short order, rather you will want to read and savor it. Horsman’s narrative is accompanied by a wealth of historical photographs to enjoy and study too. And then there is The Art of Racing in the Rain. This is the fictional story of a talented young American racecar driver as seen through the eyes….of…his dog?! Now who would have conceived of such a story? Only one person so far, Garth Stein. It’s an engaging read; kind of a Marley goes to Road America. Although admittedly there is plenty of soppy sentimentality, don’t be prematurely dismissive. There’s plenty about racing along the way as the hero, Denny Swift, overcomes personal challenges and tragedies on the way to becoming a test driver for Ferrari. The progress of his career centers on his gaining the understanding of the cars he drives, and the growth and progression of his driving talent. Satisfying the title, Denny displays his innate understanding of how, exactly, to drive in the rain. I did hesitate at one point in the story though, questioning the probability, timing, and placement for a group of automobiles. See if you can find it and if it strikes you the same as it did me. I suspect too that the book works especially well for those of us who already share our lives with canine friends. How often have we attributed certain powers of observation to them? Still, I wonder if they are all as astute as this one. Both books are “good stuff” and terrific reads. Racing in the Rain by John Horsman is a book that answers all the questions you have ever wished you could ask the brilliant Wyer organization. It deals with three different and important topics in the context of Horsman’s time working for the Gulf Wyer Team. Horsman sets the scene historically, shares the politics of running a small team for a large companies and fascinates us with stories about drivers and racers that we have never heard before. Read this book and your pecking order of favorite drivers will change. He worked with these people and knew and liked them. He documents what happened and allows us to draw our own conclusion about how drivers were selected and then performed. It’s fascinating. From a historical viewpoint the book is a revelation. The development of the American Ford GT-40 effort as witnessed from England, the development of the German Porsche 917’s, again viewed from the hired factory team’s view. It’s a great read. Oddly, when the team controls its own destiny entirely and runs the Mirage, the story seems less compelling. No bad guys. If you are as fascinated by the Ford factory racing era as I am you might enjoy the following books: A.J.Baime’s Go Like Hell is the best story so far about Henry 2's dreams for his company and how those around him ran the racing program. Contains a different view of the Wyer program and it is fun to contrast the two books. It’s a good story too. GT40 by Ronnie Spain is “An Individual History and Race Record” of ever GT40 ever made. This is a straightforward history of each car with great pictures. More focused on the Shelby Cobras than the GT40’s but of the same period and related, are Peter Brock’s book, The Cobra Daytona Coupe and the Cobra-Ferrari wars by Michael Schoen. Both these books are excellent reads and keepers. Brock's book is out of print and the Schoen book, reviewed elsewhere on the site, is a revised edition. 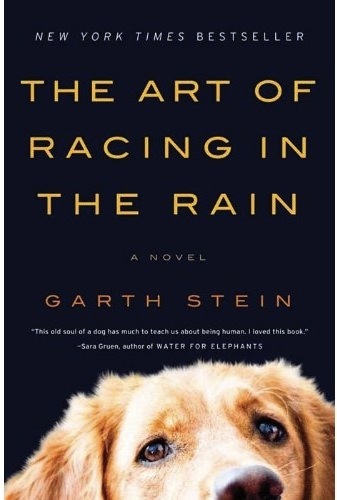 The Art of Racing in the Rain by Garth Stein is a modern novel about a sad love affair. I am not a novel reader generally and only the title and the gushing reviews sucked me into picking up this book and reading it. I was also intrigued by the fact that the story was being told by a dog. Yes, a bow-wow type dog. And you know what, it works! The second “hook” is that the male portion of the love affair is a race driver/instructor struggling to get his career going and his dog understands it all. I haven’t read a love story since….hmmm Love Story. I call it “modern”. Read this book and, though you will enjoy it, you might just long for those simpler days when a rich boy’s only real problem was avoiding poor girls at an ivy league school. Oh, and the racing stuff is pretty good reading too.